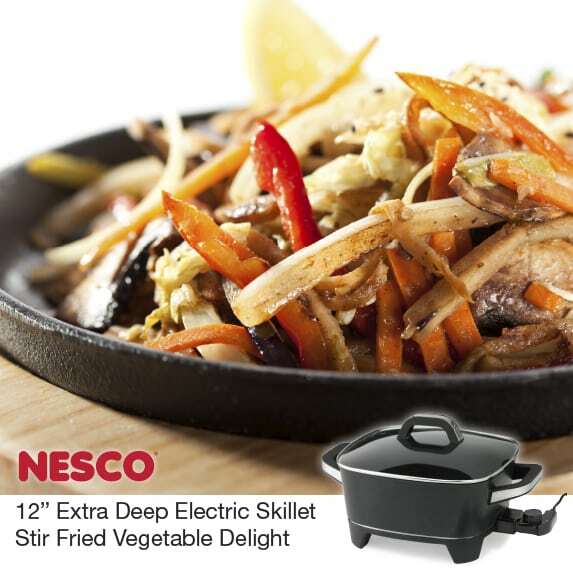 This vegetable packed dish is quick and simple with your NESCO 12 inch Electric Skillet. You’ll love the depth of flavor and the freshness of all the vegetables. A touch of lemon juice adds just the right amount of brightness. For seafood lovers simply add the optional precooked shrimp. Try and let know what you think. Also, let us know what other recipes you like to make in your NESCO Electric Skillet. Combine oil, garlic, ginger root, onion, peppers, beans and carrot and place in the preheated NESCO 12 inch Electric Skillet for 3 minutes. Add mushrooms, bok choy, zucchini, tofu, herbs and shrimp. Pour lemon juice and soy sauce over vegetables and cook 3-5 minutes. Serve over rice. Serves 1-3.